The New Reproductive Health Act (RHA) in New York State – What Does it Mean for You? 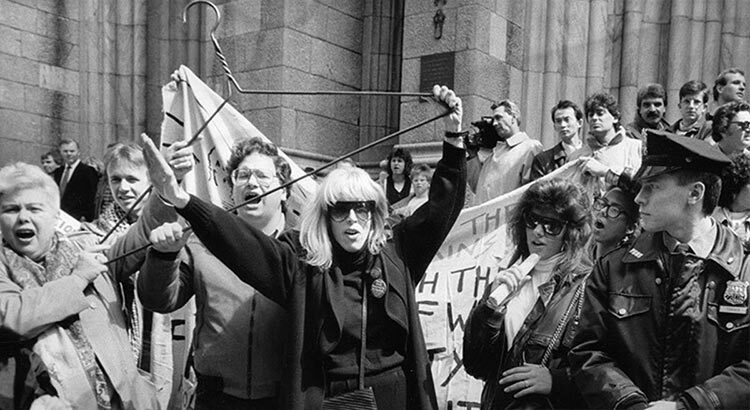 Merle Hoffman raises her trademark hanger outside St. Patricks Cathedral in New York in 1989. This was the first pro-choice civil disobedience action in history. Ten years later in 1998, I wrote the following list of action items to guide the pro-choice movement into the future. 1. We must reclaim and honor our history. We must remember the women who alone and in pain lost their lives for their right to choose. 2. We must throw off our personal shrouds of shame and tell the stories of our mothers and grandmothers, and ourselves. 3. We must close the split between the strategists and national leaders of the pro-choice movement and its foot soldiers, the women who have actually had abortions and the providers who make them possible. Together, we must reposition and redefine legal abortion as an integral core of women’s health and as the necessary condition for women’s freedom. Nothing stops abortion — no law, no government, no religious authority. Making abortion illegal only makes it dangerous and deadly. 4. The movement must speak with a unified voice that articulates a shared vision. Abortion and reproductive freedom are fundamental human rights, not to be abridged by any entity. We must actively strategize, not only for the next skirmish or the next battle, but for the coming 25 years — to ensure that our daughters and granddaughters do not have to fight the same war. 5. 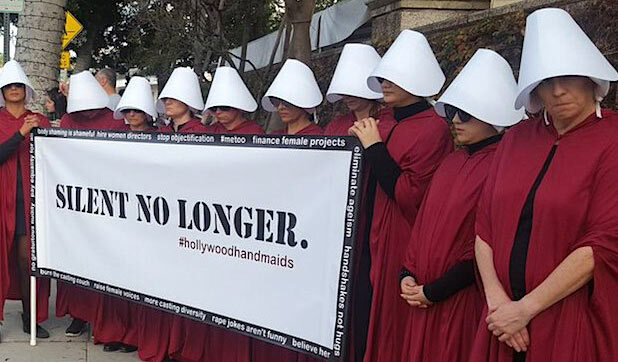 We must move in powerful coalition with other progressive movements — gays and lesbians, civil rights organizations, environmental activists, labor — and demand that the leadership of these movements actively support reproductive freedom. 6. We must expose the fifth column within our own ranks, feminists who are “pro-choice” but handle their personal discomfort with abortion by naming it a “tragedy” and thus making it more difficult for others to choose freely. 7. 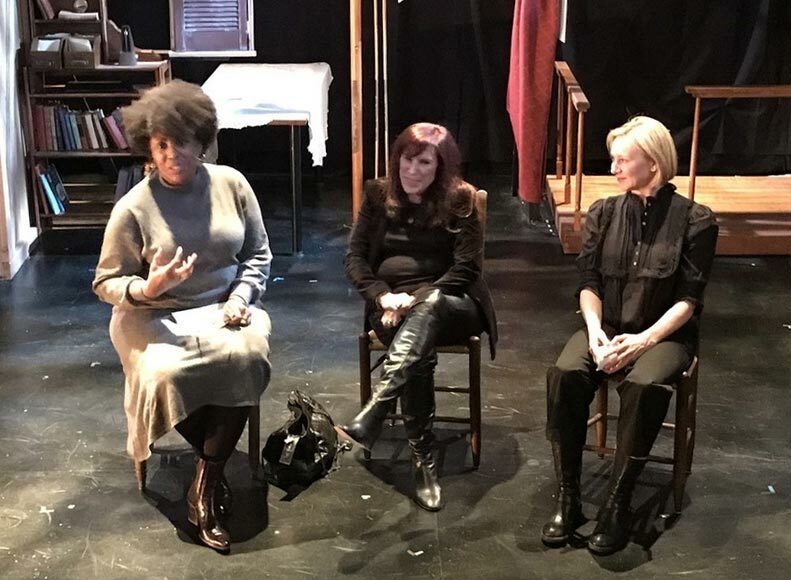 We must expand the definition of pro-choice to include those women living with racism and poverty for whom the right to reproductive freedom means the right to bear children with adequate financial and medical support. 8. We must reach out to the young women who live a feminism of entitlement rather than struggle, and do not understand that freedom requires constant vigilance. 9. We must be militant when necessary and be ready to sacrifice more then freedom for the cause. 10. We must creatively develop new legal theories that further secure the constitutional basis of reproductive freedom. 11. Finally, we must be able to speak the truth to ourselves by answering the question, “Is it a woman’s right to choose or is it killing?” by saying yes — to both — and taking full responsibility for that profound and powerful truth. Women’s rights remain in a state of emergency. If not now, when? 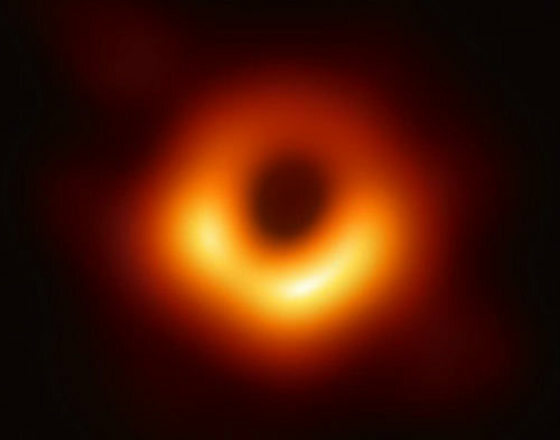 If not you–then who? 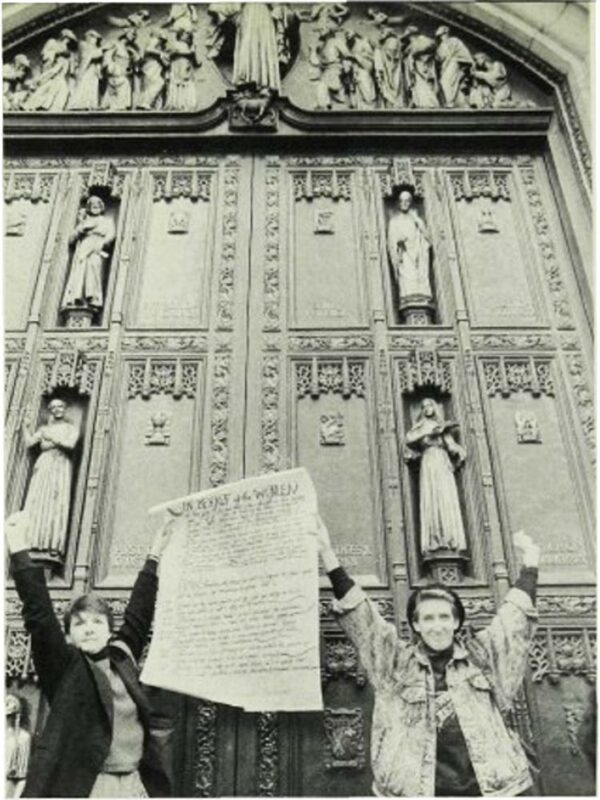 Mary Lou Greenberg and Maria Lyons unfurling the Proclamation at St. Patrick’s Cathedral in 1989. 1. Women are full moral agents with the right and ability to choose when and whether or not they will be mothers. 2. Abortion is a choices made by each individual for profound personal reasons that no man nor state should judge. 3. The right to make reproductive choices is women’s legacy throughout history and belongs to every woman regardless of age, class, race, religioin, or sexual preference. 4. Abortion is a life-affirming act chosen within the context of women’s realities, women’s lives, and women’s sexuality. 5. Abortion is often the most moral choice in a world that frequently denies healthcare, housing, education, and economic survival.